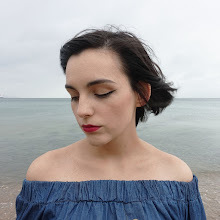 Here we go again: outfit post numero dos! 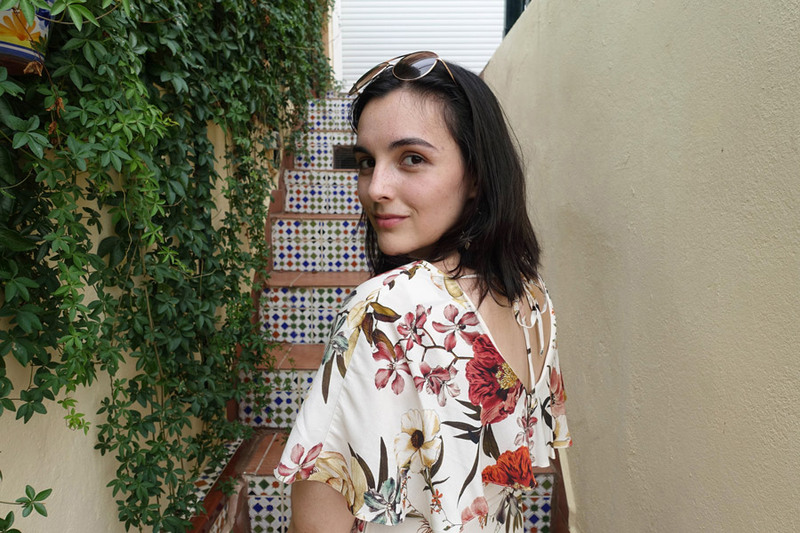 This time around, it's a particularly special one, as it's from my family break in Málaga! So I guess you could say that this is actually an outfit post... ON TOUR. Woot! I’ve never been abroad with the fam other than visiting relatives in the UK, so as this was my first sun holiday with them, I was pretty clueless when it came to packing. I'm generally quite conservative in what I wear, avoiding ~skin exposure~ as much as poss, but at this time of year, when most holiday garments are slightly see through and intended to be thrown over a bikini, it's tough to find the perfect holiday dress. 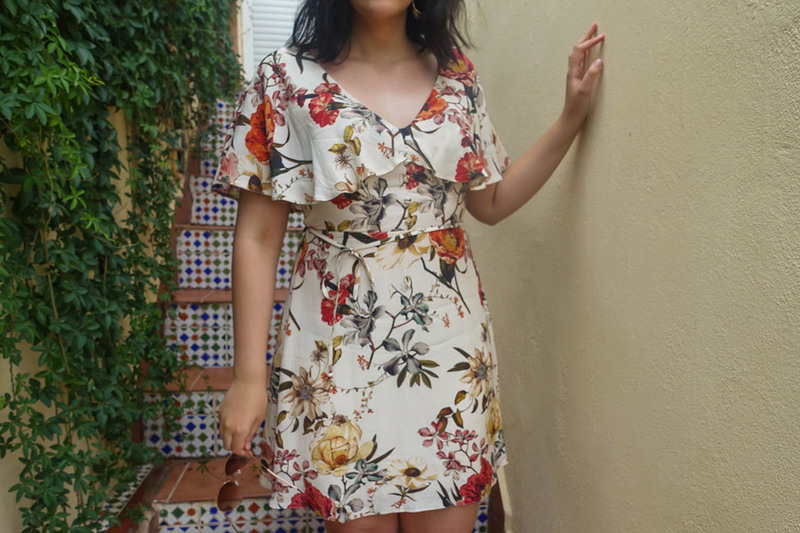 I'd been desperately keeping a beady eye out for anything ~family holiday appropriate~ though, and luckily this godsend of an outfit came to my rescue. I spotted this knee length floral dress in River Island. 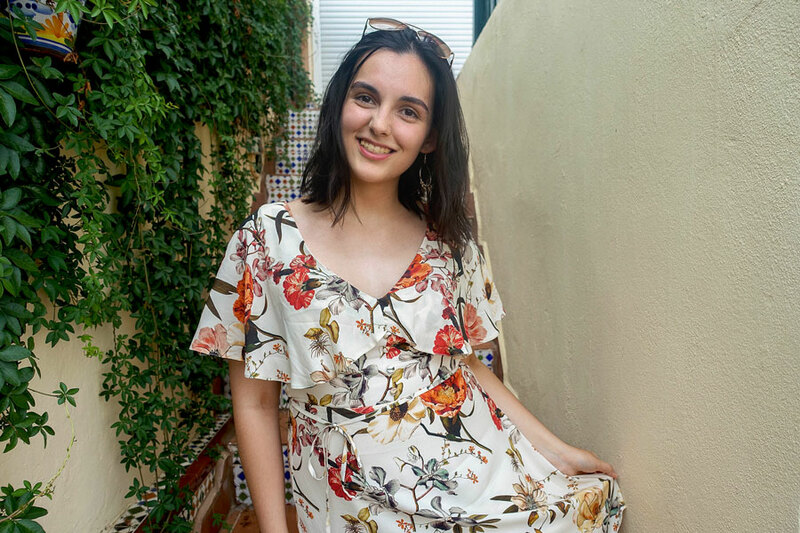 While it's actually intended to be worn as a tea dress, I thought it would be perrrfect to wear whilst exploring the streets of Málaga. Of course, the bold floral pattern contrasting against such a neutral cream crepe fabric is initially quite eye catching, but what really drew me to this piece (& straight to the dressing rooms) was the flouncy cape which is designed to drape over your shoulders, covering your upper arms and giving you the option to ditch the cardie. For me, however, its sole function was to shield my shoulders from the sun and cease my irrational fears of burning to a crisp. Although this superhero-burn-prevention cape was a huge selling point for me, I've got to say, I probably wouldn't have paid the price I did if it weren't for the additional details and embellishments that it features. 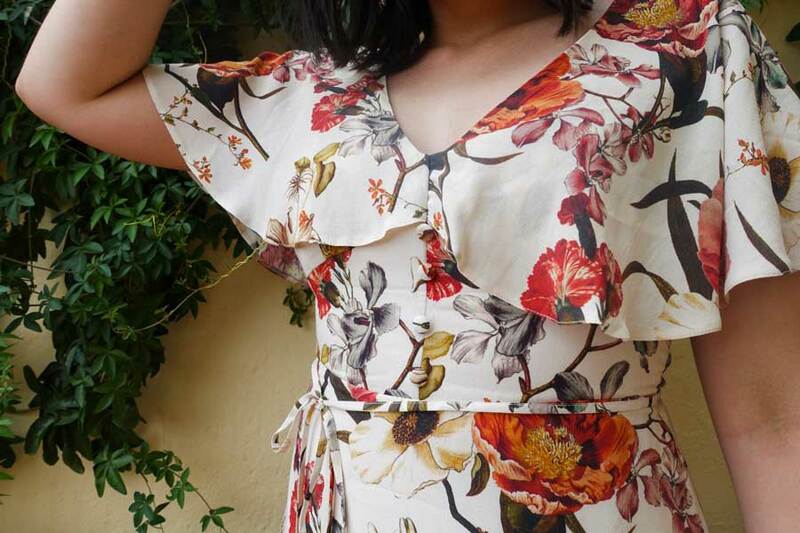 For example, the button-down front, the super sweet waist tie (even though the silhouette is already cinched at the waist) aaand the neck tie that allows you to determine how low your sleeves hang. Although they're all totally unnecessary add-ons, I think they really contribute to the whole innocent, elegant afternoon tea party/picnic/BBQ look n’ feel. I rarely dare to grace the door of Penneys/Primark anymore. After years of trying, it's just WAY too difficult to find clothes that fit, flatter, and most importantly, LAST. However, I have been on the hunt for some decent activewear as of late, and I'd heard amazing things about Penney's, so after filling my basket with sports bras and sneakers, I took a gander over to the jewellery section and found these earrings. 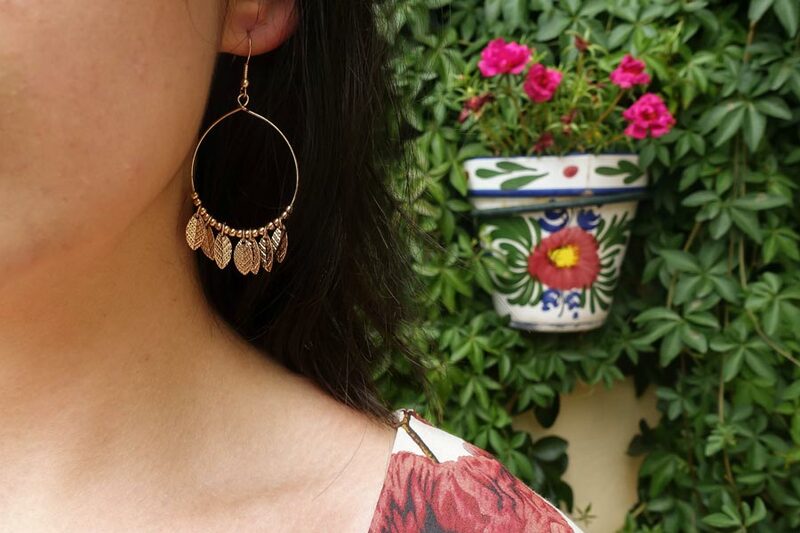 I've NEVER worn hoops in my life as I've always thought that they were a little bit too out there for me, but after spotting these bronze-gold ones with these lil' leaves dangling from them - how could I say no? I don't even know if people really wear earrings on holiday, but I figured that if I was going to have a couple of makeup free days abroad, the earrings could at least add a touch of femininity around my face. I also paired them with a bunch of other not-so-glamorous outfits and I thought they gave each OOTD more of a holiday vibe. I'm just gonna put it out there: these aren’t my sandals. After just an hour of walking around Málaga, they'd already given my mum a couple of cuts and blisters so we did a switcheroo. She'd bought them in Dunnes Stores because we knew that a tan coloured shoe would just match absolutely anything. 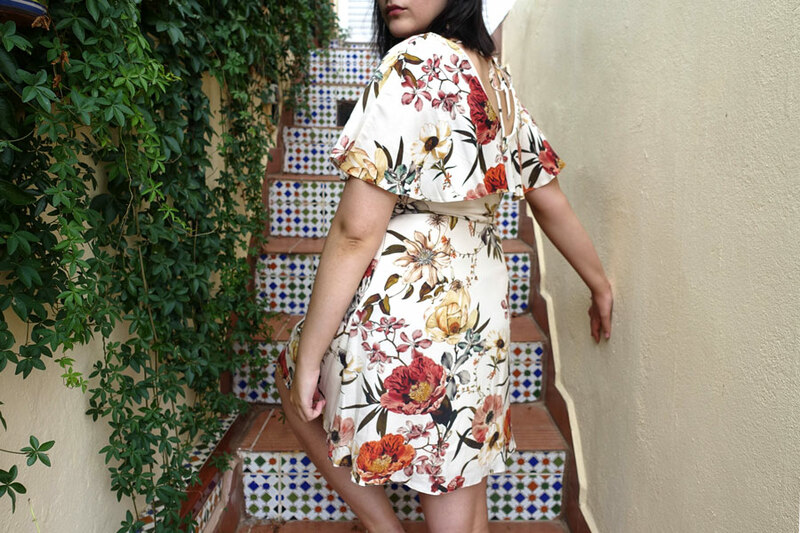 And we were right - they ended up complementing my dress suuuper well and the corresponding flowers between the dress and the sandals made this outfit seem way more planned than it actually was. Shame they weren't just a little more comfortable though. And as for ~the face~, I didn’t bother with makeup. I’ve been going through an amazingly clear patch with my skin for the first time in like 7 years and I didn’t think that foundation x sweaty upper lip was going to prolong my acne free days, so it was a great chance to give my skin a breather. I added a couple of waves to my hair though, going for a beachy kind of vibe and I was happy with how well it complemented the flowy-ness of the dress. Some similar & even better items which can all be found on ASOS! That's such a pretty dress <3 Perfect for the end of summer. Isn't it fab! Thank you so much for commenting!! I am loving that gorgeous floral print! You look cute:) I really like the dress!! 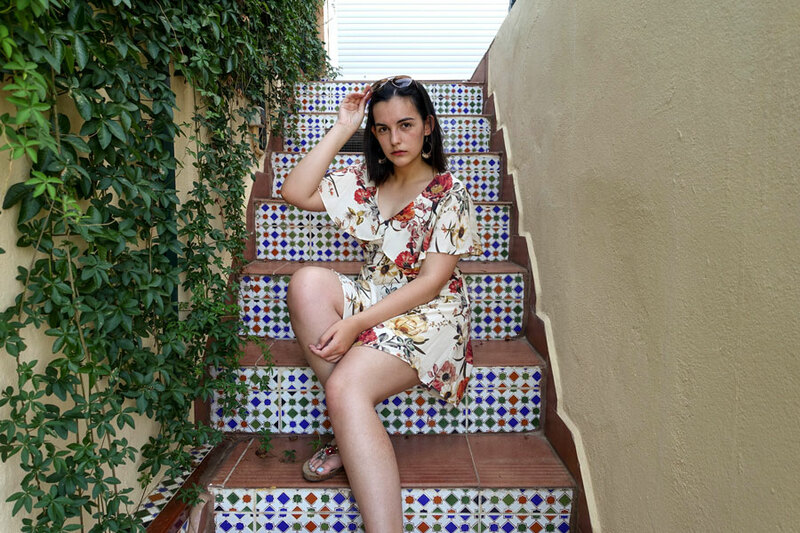 Such a pretty print on you girl!